Bratz dolls have proved it's possible to beat Mattel even if you have an oversized, empty head. 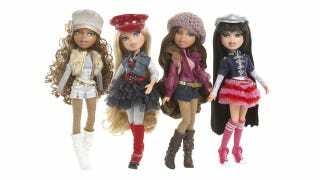 The years-long legal battle over whether or not Bratz creator Carter Bryant came up with the idea for making even more distorted fashion dolls while he worked for Mattel came to an end today, with a jury finding Bratz manufacturer MGA Entertainment didn't infringe on Mattel's copyright or steal trade secrets. Despite the win, the legal battle may have hurt the Bratz brand irreparably. It's unfortunate, because without Bratz girls will only hundreds of other options for doe-eyed, pouty-lipped playthings. Earlier: Does This Look Like Intellectual Property To You? Does This Look Like "Intellectual" Property To You?